Chemistry at Extreme Conditions covers those chemical processes that occur in the pressure regime of 0.5–200 GPa and temperature range of 500–5000 K and includes such varied phenomena as comet collisions, synthesis of super-hard materials, detonation and combustion of energetic materials, and organic conversions in the interior of planets. The book provides an insight into this active and exciting field of research. Written by top researchers in the field, the book covers state of the art experimental advances in high-pressure technology, from shock physics to laser-heating techniques to study the nature of the chemical bond in transient processes. The chapters have been conventionally organised into four broad themes of applications: biological and bioinorganic systems; Experimental works on the transformations in small molecular systems; Theoretical methods and computational modeling of shock-compressed materials; and experimental and computational approaches in energetic materials research. Chemists, physicists, materials scientists and computational scientists and researchers working in academic and governmental institutions with an interest in high-pressure physics and chemistry, and energetic materials. Chapter 1. Pressure-Temperature Effects on Protein Conformational States (K. Heremans). Chapter 2. High Pressure Effects in Molecular Bioscience (R. Winter). Chapter 3. Molecules to Microbes: In-Situ Studies of Organic Systems Under Hydrothermal Conditions (A. Sharma et al.). Chapter 4. Application of High Pressure in Inorganic and Bioinorganic Chemistry (R. van Eldik, C.D. Hubbard). Chapter 5. High Pressure Materials Research: Novel Extended Phases of Molecular Triatomics (Choong-Shik Yoo). Chapter 6. Nitrogen-Containing Molecular Systems at High Pressures and Temperature (Yang Song et al.). Chapter 7. Aqueous Chemistry in the Diamond Anvil Cell up to and Beyond the Critical Point of Water (W.A. Bassett). Chapter 8. Solid Nitrogen at Extreme Conditions of High Pressure and Temperature (A. Goncharov, E. Gregoryanz). Chapter 9. Non-Equilibrium Molecular Dynamics Studies of Shock and Detonation Processes in Energetic Materials (B.L.Holian et al.). Chapter 10. A Multi-Scale Approach to Molecular Dynamics Simulations of Shock Waves (E.J. Reed et al.). Chapter 11. Plastic Deformation in High Pressure, High Strain Rate Shocked Materials: Dislocation Dynamics Analyses (Mutasem Shehadeh, Hussein Zbib). Chapter 12. Shock-Induced Chemistry in Hydrocarbon Molecular Solids (M.L. Elert et al.). Chapter 13. At the Confluence of Experiment and Simulation: Ultrafast Laser Spectroscopic Studies of Shock Compressed Energetic Materials (D.S. Moore et al.). Chapter 14. 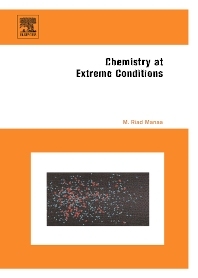 The Equation of State and Chemistry at Extreme Conditions: Applications to Detonation Products (J.M. Zaug et al.). Chapter 15. Theoretical and Computational Studies of Energetic Salts (D.C. Sorescu et al.). Chapter 16. Computational Determination of the Energetics of Boron and Aluminum Combustion Reactions (P. Politzer et al.). Chapter 17. Chemistry of Detonation Waves in Condensed Phase Explosives (C.M. Tarver, M. Riad Manaa).